In 2009 my first memoir came out, Blue Like Play Dough. Yes, I might have been hoping to ride on the tails of another popular book at the time . . . Blue Like Jazz. As a mom of three at the time I felt stretched and pulled like a piece of play dough. There was part of my life that felt filled with crumbs. In 2009, John and I had been talking about adoption. I had no idea that at the end of 2009 we’d be chosen by a birth mom to adopt her baby girl. Or, in the next five years we’d adopt six more children from foster care. I almost laugh as a mom of ten kids—many of them with special needs—of what advice I could gave as a mom of three. My view of parenting was so narrow at the time. I didn’t understand what is was like parenting a child with learning disabilities or medical conditions. Yes, there were parenting struggles, but compared to what I’ve faced after these adoptions I didn’t understand that there could be so many more bigger, more difficult issues that parents face. I understand that now. By physically going to God every morning, I’m placing myself in His hands. His love smoothes out the rough edges and reminds me I don’t need to do everything for everyone. I just need to accept love and give it. He’ll take care of the rest. I’ve been a mom for nineteen years, and I’m still not a perfect parent or person. I’m a mess actually. But I’m a mess that I let God get a hold of. Not because I’m spiritual, but because I was—and am—desperate. I’ve done many things wrong, but I do one thing right. When I’m uncertain, I seek God. And I fill up with His love in order to pour it out. Not always first, but eventually. It’s easy to share how I got that right eight years ago—the need to turn to Jesus—but it’s harder to share what I got wrong. But recently, when talking to one of my adult children, I learned where I’d missed the mark . . . I’d put too much pressure on my kids to be perfect, even if it was unintentional. Just like a pastor’s kid or missionary kid, I learned there is pressure being raised by a well-known author. Often my kids didn’t share their struggles because they didn’t want to disappoint me (or my readers). They wanted me to think they always got it right. And that’s what I’m changing as I’m actively parenting kids ages 6-17. I’m letting my children know that I expect that they will mess up—everyone does—and I will always be here for them when they do. They can come to me and talk to me about anything. Also, if any of us was perfect we wouldn’t need Jesus. I urge you to do the same with your kids. Let them know they can come to you when (not if) they mess up. Finally, I’d love to hear what you got wrong (and right) during your parenting years. You can always send me at short note at: tricia@triciagoyer.com. This is my personal email that I only give to friends. And, yes, I do consider you a friend. And remember if this summer is making you feel stretched and pulled take time to place yourself in God’s hands! P.S. 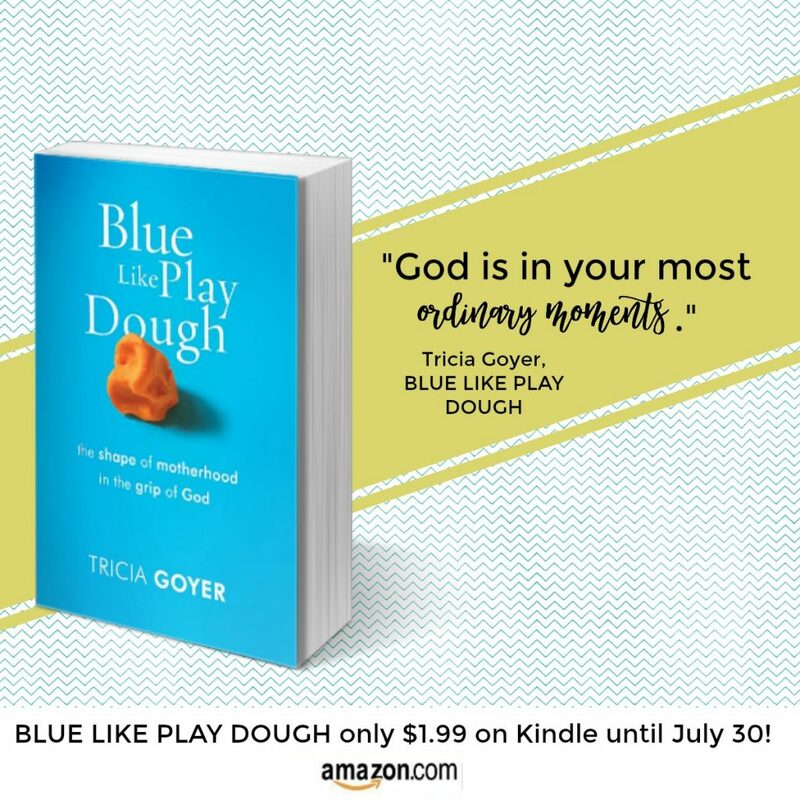 Read the first chapter of Blue Like Play Dough for free here!